Rotary Wheatbelt Teacher Champion Awards – Vote in the People’s Choice Award for your School Video! Links to the Entry Videos! We are thrilled that three Wheatbelt schools will again participate in the Rotary Swim for Reading at Bruce Rock Aquatic Centre on 25 March 2018. Quairading and Narembeen District High Schools will join Bruce Rock DHS at the swim for the second year running. This year the Swim has been renamed as the “Rotary Wheatbelt Swim for Reading” to help clarify the main purpose of the event. 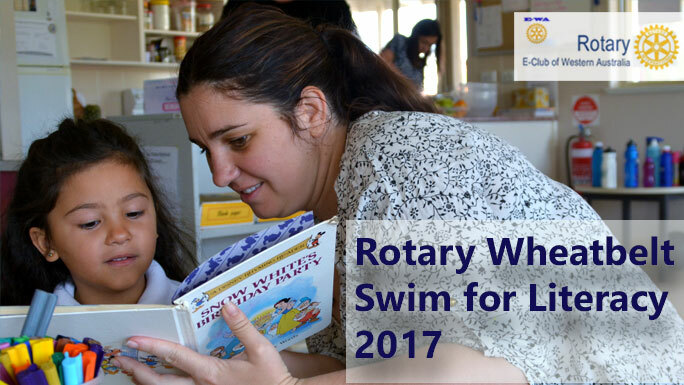 The Swim supports our Rotary Love of Reading program, which encourages young Wheatbelt children to read and be read to more, because they’ll develop better literacy skills that way. The Swim will start at 10.30am on 25 March, with registration from 10am. The Rotary Wheatbelt Swim for Reading is a fundraising and community event for participating Wheatbelt schools. E-WA will provide reading grants to Narembeen and Quairading to top up swim fundraising by those schools. E-WA will continue to support Bruce Rock DHS by way of the successful Reading Rabbits and Reading for Life reading incentive programs, funds for which are raised via the annual Swim event. All three school communities will also have access to a number of RYPEN personal development programs (see below). The Swim is a non-competitive event held to encourage participation by students and the community. The primary fundraising for the event is by way of sponsorship of swimmers. Registration for the Swim on 25 March is from 10am, with swimming commencing at 10.30am. Entry will be FREE. We will award Rotary Community Certificates to those who fund raise and participate in the Swim. These certificates will confirm that the recipient has supported their community and one of the participating schools by fundraising and taking part in the Swim. Community certificates are useful in many ways, including work experience and job applications. The Rotary Youth Program of Enrichment (RYPEN) is a popular leadership and personal development program for young people aged 14-17. As in 2017, we will book a number of places on the RYPEN program for those who excel in their efforts on behalf of the 2018 Swim. RYPEN places are in demand because the program is enjoyable, challenging and helps participants achieve their potential. The Swim RYPEN pack, which includes RYPEN information and an application form, can be downloaded here. You’re welcome to come and cheer the swimmers on, too. Spectator entry to the Swim will be FREE. We’ll have a sausage sizzle to deal with those hunger pangs, too. Only $5 per serve! 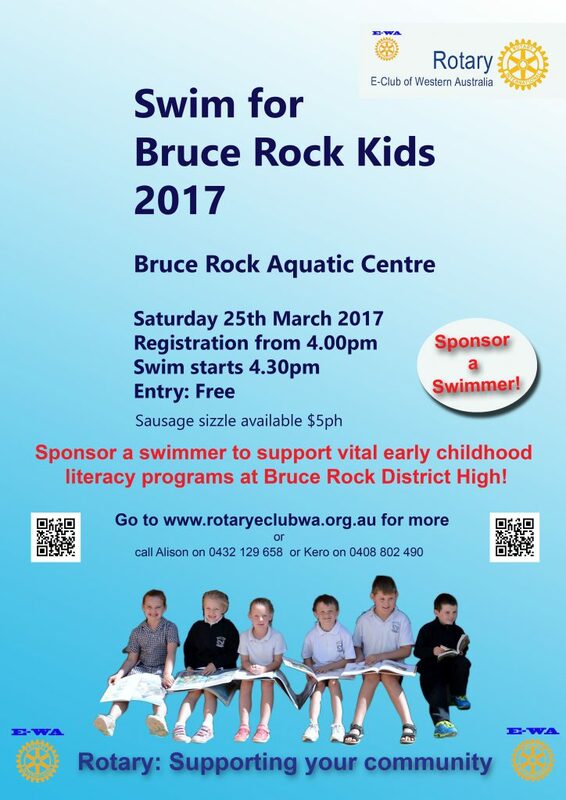 Our Bruce Rock poster for the 2017 Swim for Bruce Rock Kids on 25 March 2017. 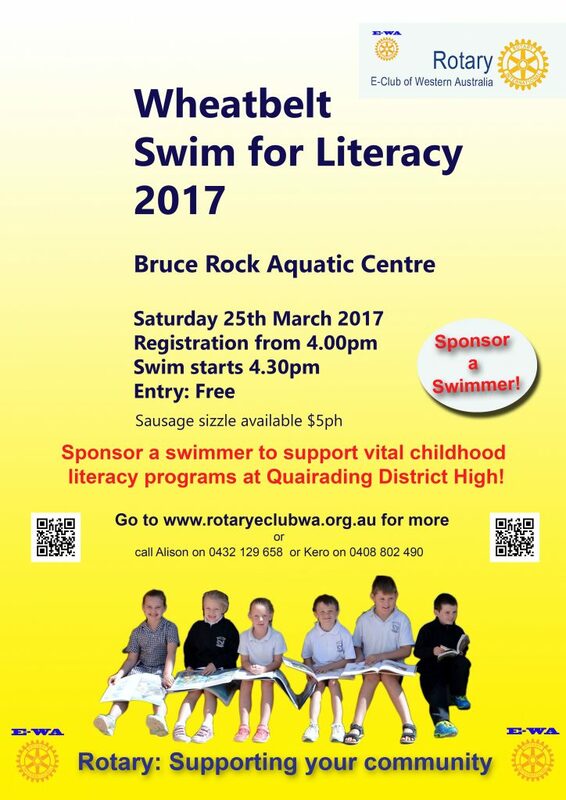 Our Quairading poster for the 2017 Wheatbelt Swim for Literacy on 25 March 2017. Our Rotary Bruce Rock Swim is less than a month away! We want to share news about an incentive scheme that we’re offering students at Bruce Rock, Narembeen & Quairading District High Schools, in order to encourage them to fund raise for and participate in the 2017 Swim, which will be held on 25 March 2017. We will award Rotary Community Certificates to those who fund raise and participate in the Swim. These certificates will confirm that the recipient has supported their community and one of the participating schools by fundraising and taking part in the Swim. Community certificates are useful in many ways, including work experience and job applications. The Rotary E-Club of Western Australia (“E-WA”) will be happy to confirm the contributions made to the 2017 Swim by certificate recipients. The Rotary Youth Program of Enrichment (RYPEN) is a popular leadership and personal development program for young people aged 14-17. We will book a number of places on the RYPEN program for those students aged 14-17 who excel in their efforts on behalf of the 2017 Swim. RYPEN places are in demand because the program is enjoyable, challenging and helps participants achieve their potential. It’s as easy as 1-2-3-4! 2. Read about the Swim and download sponsorship forms. 4. Participate in the Swim between 4pm and 7.30pm on 25 March! We are delighted that three Wheatbelt schools will participate in the Swim at Bruce Rock Aquatic Centre on 25 March 2017. 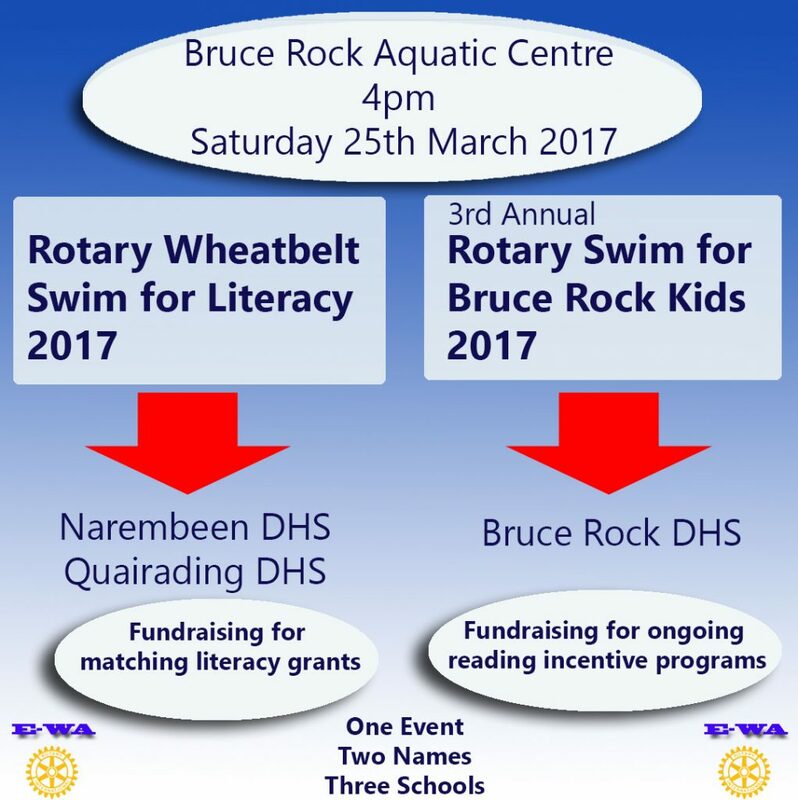 Quairading and Narembeen District High Schools have accepted our invitation to participate in the inaugural Wheatbelt Swim for Literacy (“Wheatbelt Swim”) to be held at the Bruce Rock Aquatic Centre on Saturday 25 March 2017. The Wheatbelt Swim and our third annual Swim for Bruce Rock Kids will be held as one event (“Swim”), with registration starting at 4pm. The Swim is a fundraising and community event for participating Wheatbelt schools. E-WA and our charity, The Rotary Foundation, will provide grants to Narembeen and Quairading. E-WA will continue to support Bruce Rock DHS by way of the successful Reading Rabbits and Reading for Life reading incentive programs, funds for which are raised via the annual Swim event. Registration for the Swim on 25 March will commence at 4pm, with swimming commencing at 4.30pm and the Swim will conclude by 7.30pm. Entry will be FREE. Swim for Bruce Rock Kids on 25 March. The 2017 Swim for Bruce Rock Kids is on Saturday 25 March 2017, with registration commencing at 4pm. We’re holding our third annual Swim for Bruce Rock Kids at the Bruce Rock Aquatic Centre on 25 March 2017, with registrations from 4pm on. This year’s event promises to be the biggest and best yet! And you’re invited! 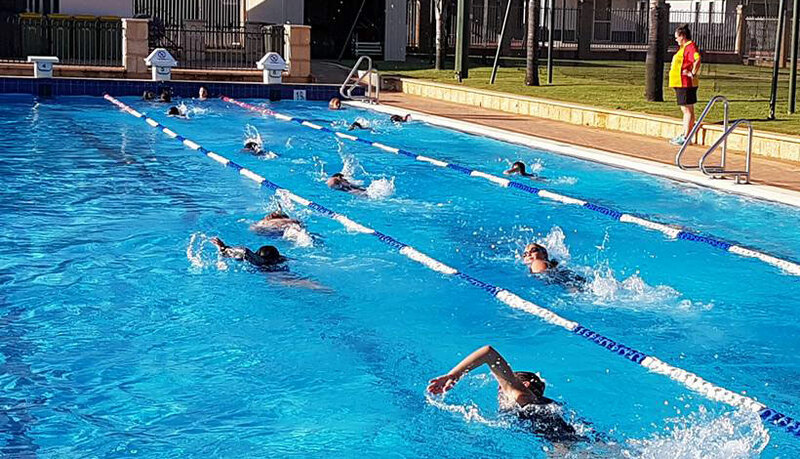 The Swim is a community event that will raise funds for two important reading incentive programs supporting vital literacy development for pre-primary and year 1 students at Bruce Rock District High School. The Reading Rabbits and Reading for Life programs commenced in 2016 and Principal Fiona reports a significant increase in reading nights over the previous year. 3. Making a donation to the reading incentive programs. If you’re interested in supporting literacy development for Bruce Rock kids and would like to join a fun community event, this is for you. Entry is FREE! We’ll also offer a sausage sizzle at nominal cost to keep those hunger pangs at bay, so dinner is taken care of too!. We look forward to swimming with you for the kids on 25 March. E-WA Rotary is delighted to announce the election of Alison Lockwood as President of the Provisional Rotary E-Club of Western Australia (E-WA Rotary) for the 2016-17 year. Alison’s election is a first, as Bruce Rock has never before had a resident Rotary club president. As a past Rotaract club president and an experienced Rotarian, Alison brings a wealth of experience and enthusiasm to her new role. Alison, a health professional at Bruce Rock Memorial Hospital and partner Tim (our first Partner Associate) have set up home in Bruce Rock and are keen for their adopted community to experience the benefits of a Rotary presence. In her current role as our E-WA Rotary Community Director, Alison played a key role in organising our first E-WA Rotary initiative in Bruce Rock in February 2015, when we conducted the successful Swim for Bruce Rock Kids, which raised funds for a literacy development program in the local community. Alison is looking forward to her term as E-WA Rotary President. Rotary Wheatbelt Love of Reading Teacher Champion Awards – Winners Announced on 29 June!